Sometimes people use the phrases marble cleaning and marble polishing interchangeably. We have run across a number of people who believe that the dull look on the marble floor or travertine floor can be removed by cleaning. Often times, cleaning the floor using our pressurized cleaning process makes the floors look significantly better. In fact, the grout lines are often brought back to 80% of brand new. 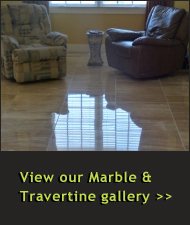 However, if the floor is dull, more than likely you will need a travertine or marble polishing process described on this page. Often when people think about marble or travertine stone they assume that no care or maintenance is required. Marble floors or marble countertops are ignored or the stone is cleaned with the wrong method or chemical. Because of misinformation or no education, the consumer is not in a good position to maintain their new stone; consequently, damage to the stones crystals sets in. The damaged crystals prevent light from being reflected evenly thereby giving you a dull look. 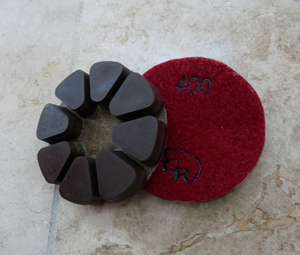 Honing is the process for smoothing the stone with the use of abrasives. We use either a weighted buffing machine or our Cimex orbital machine to complete this process. We place diamond pads on the bottom of our machine. The diamonds work to abrade the floor creating a slurry. This makes the floor smooth and clean. If the floor does not have deep scratches, often the restoration project can start here. The grit level starts at 120 or so and runs to 800. Moderate scratch marks and etching can be removed through honing. Once you are into the higher grit numbers, a satin finish will be achieved. Some clients desire a satin look and wish to stop here. Others prefer a higher gloss and wish to move to the next phase, polishing. Watch this video. Do you hear the clicking sound? What this means is the tiles are not flat. If the tile lippage is greater than the thickness of a nickel you may want to have it ground down. At Surface With A Smile we possess the expertise and tools necessary to polish your natural stone. 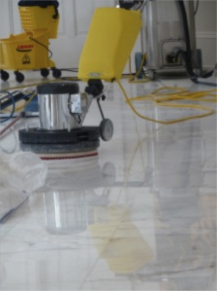 We have the top of line marble cleaning and travertine cleaning equipment and only use the highest quality of diamond abrasives. What this does is allow us to finish the job with the highest quality possible. Regardless of the type of stone, or the condition we can help. The loss of the polish on certain marble and granite can be attributed to wear. This is especially true of marble, since it is much softer than granite. The bottoms of our shoes act like sandpaper on a stone floor surface, and over time, will wear the polish off. To prevent excessive wear, it is important to keep the floor dust mopped, and place walk-off mats at all entrances. To repair a worn, or dulled, stone surface, it will be necessary to re-hone and re-polish. The dull spot created when liquids containing acids are spilled on marble is called etching. Marble and some limestone etch easily. Granite is more acid-resistance, and will rarely etch. To prevent etching, avoid using cleaners and chemicals that contain acids. Bathroom cleaners, toilet bowl cleaners, and lemon cleaners commonly contain acids. Certain drinks and foods contain acids that will also cause etching. Light etching can be removed with a little marble polishing powder. Deep etching will require resurfacing of the stone. All stone surfaces can become very easily stained. Most foods, drinks, ink, oil and rust will stain marble. Once a stone becomes stained, it can be very difficult to remove. To prevent staining, clean the spilled material as soon as possible. Blot the spill with a clean paper towel or cloth. If this does not remove the stain, a process called “poulticing” may be needed. It is important to seal stone with a good-quality penetrating sealer to prevent staining. Efflorescence appears as a white powdery residue on the surface of the stone. It is a common condition on new stone installations or when the stone is exposed to a large quantity of water, such as flooding. This powder is a mineral salt deposited from the setting bed. Spalling is the development of small pits or small pieces of stone that are popping off of the surface. This condition is common on stone exposed to large amounts of water and when deicing salts are used for ice removal. Like efflorescence, mineral salts are the cause for spalling and pitting. Instead of the salts depositing on the surface, they deposit below the surface of the stone. This causes pressure within the stone; therefore, the stone spalls, flakes, or pits. There are several reasons why a stone will turn yellow: embedded dirt and grime can give the stone a yellow, dingy look; waxes, and other coatings, can yellow with age; certain stones will naturally yellow with age. 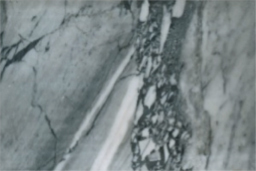 This is caused by oxidation of iron within the stone and is especially problematic with white marbles. If the yellowing is caused by dirt or buildup, clean the stone with an alkaline cleaner or wax stripper. If the yellowing is the result of aged stone, or iron oxidation, it is not coming out. Lippage is the term given to tiles that are set unevenly. In other words, the edge of one tile is higher than the next. Lippage is the result of poor installation. If the lippage is higher than the thickness of a nickel, it is considered excessive. The tile will have to be ground to flatten the floor. Settling, poor installation, and excessive vibration are the causes for cracks in stone tiles. Sometimes cracks can be repaired by using a color-matched polyester or epoxy filler. Before a crack is repaired, it is wise to find out how, and why, the crack occurred in the first place. Otherwise it may recur. Water rings and spots are very common on marble tabletops. These spots are hard-water minerals, such as calcium and magnesium. These minerals are left behind when the water evaporates, leaving a ring or a spot. To remove these spots, use a marble-polishing powder. Deep spots may require honing. To prevent spots on counters and tabletops, frequently apply a good stone paste wax. How should I take care of my stone? Vanity tops may need to have a penetrating sealer applied. Check with your installer for recommendations. A good quality marble w ax or non-yellowing automobile paste wax can be applied to minimize water spotting.